This entry was posted on Friday, May 21st, 2010 at 7:25 am	and is filed under Gluten-Free Recipes, Miscellaneous, Nutrition Therapy, Seasonal Foods. You can follow any responses to this entry through the RSS 2.0 feed. You can leave a response, or trackback from your own site. Love the jar in the frig idea. Brilliant! Looking for one now. I freeze stock in ice cube trays, then put them into a container until I need just a little bit of stock. It also melts fast when cooking. Great idea. I love to make homemade stock. My veggie scraps go into a ziploc bag in the freezer, to be made into vegetable stock when it’s full or I have the time. After straining the veggie scraps, then they can go in the compost heap! Love the jar idea. 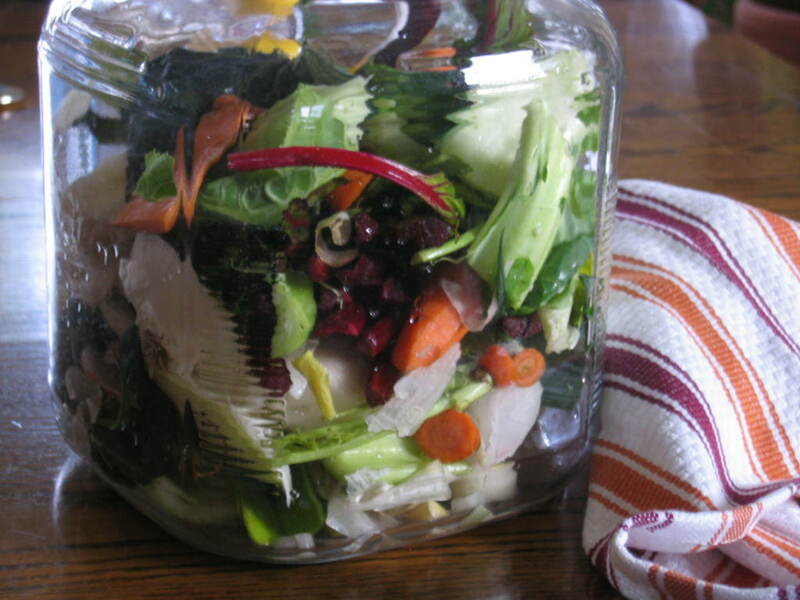 I have recently started a ziploc idea – I realize a jar is better for you though! I just need MORE jars of substantial size is all! With you all the way with this, I try to make either chicken or veggie stock whenever possible. In fact I used some today to reconstitute some cous cous before adding other ingredients. I’m a devil for storing it in the fridge and not using it in time before the rot sets in, but that’s the down side of having a very small freezer. Melissa I’ll be emailing you with details of another site’s recipe for gf tamarind and coffee cupcakes …. they look fabulous. Love the ice cube idea! I’m not an ice person for some reason so that idea didn’t come across my mind. Good one and thanks for adding it to the post! Thanks and there’s nothing more vegan than making your own veggie broth. That way you know exactly what’s in it. pdw — I absolutely love the idea of saving scraps bit by bit in the freezer. That’s a good one as well. And yes, anything not usable goes in my compost bin as well. I think I got those big jars of mine at Target or somewhere like that. I’ve had them for years and love them. They also work for the stock once it’s finished. Just wash the jar and pour the cooled stock back into it. It’s finally warmed up around here and the snow has melted (at least where I live, there’s still a ton in the high country). Not quite “heat wave” conditions, but it should be 75 or so today. I haven’t done a garden this year. The terrible hail storm we had last year destroyed mine and with my CSA membership, I’m just not all that motivated. Maybe I’ll do some potted herbs or something, but that will probably be it. I love your squash sagas. I’m sure Miles does as well. I’m not so sure about that guy at Table #5. Looking forward to GF tamarind and coffee cupcakes, although I’m doing a cleanse right now. I actually started it last month, but fell off the wagon (high impact body slam), so I started over last Monday. So far, so good. I don’t know that there is anything much better than homemade stock! I love vegetable stock! I’ve never thought of adding lemons to my stock, I bet that adds a wonderful flavor! Love your pictures as always!! I’ve been drinking lemon balm and thyme tea…. sometimes nettle and that’s been my contribution toward a cleanse. Not very good really but it’s a start and I do like these refreshing teas straight from the garden into the pot. It’s a question of listening to the body …. trouble is my body is telling me it likes cake and well as herb tea So only listen to the body when it’s absolutely necessary…. for the rest of the time read this blog and follow Melissa! I love the refrigerator idea except my refrigerator is always in overload mode (understatement!) with fresh greens, almond flour, millet flour, etc. So I tend to use the freezer more. I salvage veggies, chicken carcasses, etc. and use them all. But, I’m guilty of discarding goodies (leaves, stems) that could be used to make stock. This post is a great reminder NOT to do that–thank you, Melissa! In my next life, I truly, truly want a restaurant-sized refrigerator. Last, I so love that first photo! Great idea to use a jar to collect all those veggie bits to make stock! I’ve got to start making that a more regular practice. The batch in that photo just happened to have a lemon peel in it, that’s not something I always do. It’s usually just whatever looked good over the prior few days. Makes for some interesting stocks and weird colors (the beets and cabbage make for a purple hue). Nothing like pink soup stock! I’m so envious of your herb gardening. Are your lemon balm, thyme and nettle teas straight from the garden? I can almost smell the deliciousness of your teas. I know, I know (the cake thing). I have my own battle with baked goods calling my name. Must ignore the inner ranting as the muffins and breads seem to take hold in new and lasting ways now. Darn! I’m with you on the fridge over-load. I spent 2 hours yesterday totally cleaning out and scrubbing my fridge from top to bottom. It’s amazing what you discover (little pieces of ginger, a half-jar of capers, a small chunk of seriously “aged” cheese, a jar of beet juice. Well, you get the idea. My freezer isn’t very big and it has it’s own share of secret ingredients! I do so much cooking with soup stock that making it has become a routine for me. Even if you just make a small batch, it’s great for adding liquid to anything you’re sautéing or reheating. Good stuff, for sure. Love hearing from you. Will stop by “Food Happens” right now and see what’s cooking over there. Nice! I’m glad I found your blog. I’m trying to live healthier now and want to learn as much as I can. Another fab idea! Thanks for all you do. 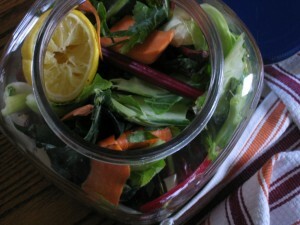 This, and that CSA will start soon, will motivate me to clean out the fridge and start fresh! Thanks and welcome. Good for you for jumping on the “trying to live healthier” bandwagon. It’s an interesting and enlightening journey, that’s for sure! So nice to hear from you! You’re sooo welcome and thanks for all you do. You’re a beacon of inspiration from which I gain good energy, so the appreciation is mutual! 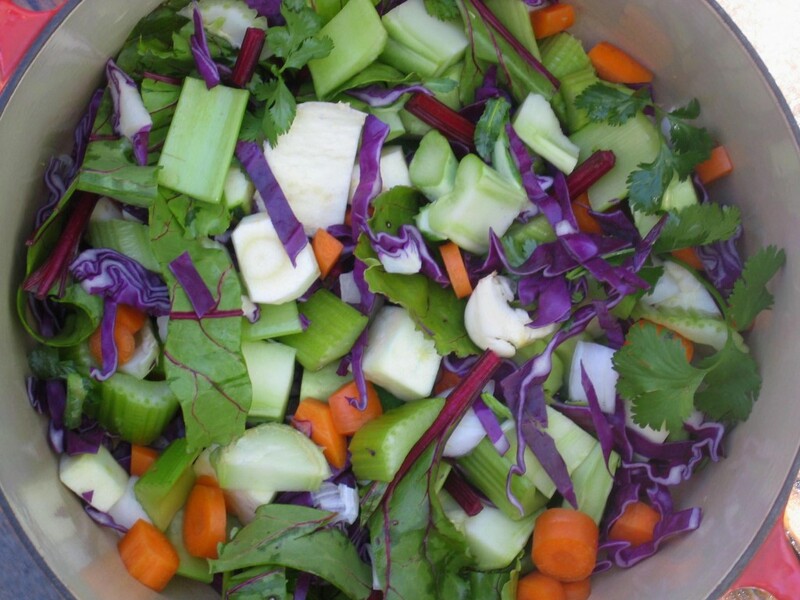 I always promote making homemade chicken stock, but never thought of making homemade vegetable stock. Thanks for sharing this recipe. I will have to share it with my readers, as well!